Get clutter under control with Better Homes and Gardens Fabric Cube Storage Bins. These spacious bins make it easy to store bulky items everywhere, including under tables and desks, inside closets and on shelving units. Better Homes and Gardens Fabric Storage Bins have a collapsible design that empowers easy storage when not in use. They're sized to fit all Better Homes and Gardens Cube Storage Organizer systems, greatly expanding your existing storage capabilities. The collapsible fabric storage bins feature two open handles for effortless mobility. They're available in 16 different colors and patterns to blend with existing decor and color schemes. Each unit includes two matching bins; Better Homes and Gardens Cube Storage Organizers are sold separately. These are much better quality than I was expecting for the price. They are very sturdy and keep their shape well. Fit the organizer perfectly. Lots of colors to choose from. Surprised me that they were a 2 pack, my mistake. Made them an even better value. Hold up well and fit the BHG cube units perfectly. These are a perfect fit with the BHG storage cube units. I have ordered them twice; once in 2017 and once in 2018. The colors were the same and so was the quality. The 2-pack is a bit less expensive than buying them singly. They hold up very well and we keep the kids workbooks, art supplies and numerous other kid things in them...they get lots of pulling and pushing. The picture on Walmart looks the bin look cheap and all the wrinkles in the fabric had me second guessing order 4 of these. They arrived and look amazing - every bit as nice as something that would be $30-40 at Pier 1. 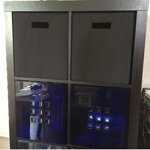 They are a must have for anyone buying the Better Homes storage furniture. 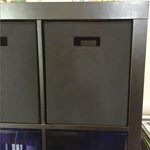 Excellent quality, best price you will find on these storage bins. Free shipping to store and an extra 5% off if you link through your Discovercard account. The dimensions in the title are wrong. They are 12.75"W x 12.75"H x 15"D (see pic) and will fit the Home and Garden 13" storage cubes. I ordered 2 sets of these in grey. And they are perfect! Fit like a glove in my BHG cube organizers and look amazing and clean cut! They feel better made and more sturdy than the previous off brand ones i had. 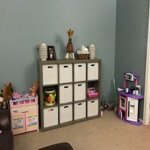 Perfect with Better Homes and Garden cubbies storage. Durable for young children. Glad I went with brand... worth the little extra money. Great except the handles aren't sewn neatly. 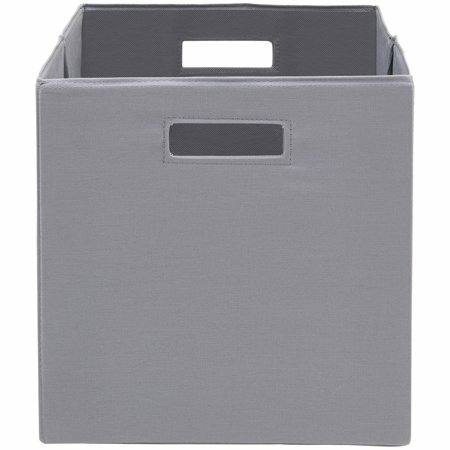 Accurate gray color, and nice, functional size - it can even hold large binders, and/or average sized children's toys. The opening where you put your hand to pull it in and out is not sewn perfectly on most of them, so it didn't appear as nice as the pictures, hence the 3-stars.